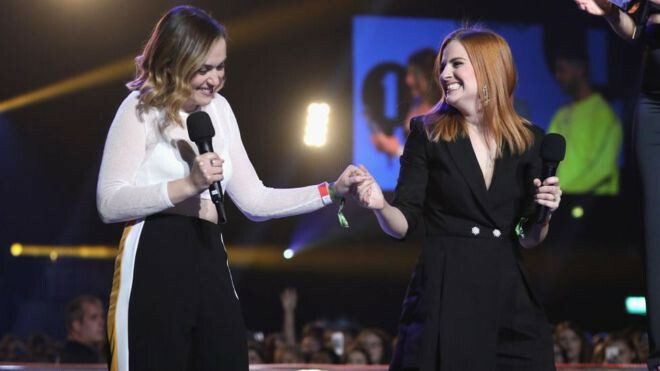 Huge congratulations to british internet stars and Creative Law & Business clients Rose Ellen Dix & Rosie Spaughton – best known to their fast-growing fan base as Rose & Rosie – were announced as winners of the 2017 BBC Radio 1 Teen Awards ‘Best British Vlogger’ last night. The award, which has been a part of the show since 2013 is voted for by fans and Rose & Rosie join the alumni of previous winners Zoella (2013, 2014), Joe Sugg (2015) and Dan & Phil (2016). The show took place at SSE Arena, Wembley, and saw Rose & Rosie also hosting Radio 1’s exclusive backstage coverage of the event – notable guests who were interviewed by the girls included Rita Ora, Liam Payne, Dua Lipa, The Vamps and Camila Cabello. Commenting on their win, Rosie said: "Rose and I are over the moon to have won this award and we couldn't have done it without our amazing audience. They are the reason we get to do what we do and we love them so much!" The married couple have over 1 million subscribers between them on their YouTube channels, their vlogs ranging from the hilarious 'Let's Play Games' series to the more serious #RealTalk. The girls even shared their wedding day with fans, with the video attracting over 1.4 million views and being covered by most major media outlets, instantly making them one of the most recognised icons in the LGBT community. This latest award caps off an amazing year for Rose & Rosie who have been incredibly busy with two sold-out tours in the US and UK – they took their Exposed Tour around the UK April this year culminating in a sell-out performance at London's Shepherds Bush Empire, and then on to North America from September with events in Seattle, San Francisco, Los Angeles, Chicago, New York City, Miami and Toronto. They are no strangers to the awards scene, being crowned ‘Celebrity Rising Stars’ at the 2016 British LGBT Awards, winning ‘2017 Vlogger of The Year’ award at the annual YouTube gathering, Summer In The City, and also making it onto the coveted ‘AfterEllen Hot 100 List’. Away from their social media work, the girls appeared at the 2017 London Pride carnival (as part of the Barclays float alongside Tom Daley) and have launched a successful line of merchandise through their own webstore. They have also worked with an array of brand partners including Netflix, Sony Pictures, Dominos, Sloggi, Best Fiends and many others. Rose & Rosie’s final major public appearance of 2017 will be at HelloWorld at Genting Arena in Birmingham at the end of October, bringing their infectious humour to a ground-breaking new live event – which will see the girls performing brand new material as well as specially adapted segments from their Exposed tour. 2018 is set to be even bigger for Rose & Rosie with some amazing projects in the works…stay tuned to their YouTube channel for more big news!